Here you can see some troubleshooting tips so you can analyse any workflow problems in your system. If there are no possible agents assigned to the task or it is not set to status 'General' (available to all users) then this is most likely the reason for the agent assignment issue. You need to add users/positions/Org Units/etc to the task or set it as General. If you use a Rule then you can simulate the rule execution via the 'Simulate rule resolution' button in PFAC. A rule will receive data at runtime from the workflow container so please check the binding in the workflow definition to see what data should be passed from the workflow container to the rule container. Then select the work item instance that has the problem and use the data from the workflow container for your simulation. When using the Simulation option in PFAC make sure you use F4 to enter the test container data. If the agents returned are not what you expected then you must check the rule implementation e.g. do you use a custom function module or have you maintained Responsibilities. If you use an expression to determine the responsible agents then you will need to check the work item instance where the problem has occurred and see what value is contained in the expression in the workflow container. If it is a value that is unexpected then you must identify where the expression is filled in the workflow and investigate why the value is incorrect. A good way to find out exactly which steps use a particular container element is by right clicking on the container element in the workflow builder and selecting the "Display were-used list in graphic". This will highlight all the steps where the container element/expression is used. An asynchronous task is being executed by a user. While the work item is being executed the terminating event is raised in the system and tries to set the work item status to COMPLETE but cannot due to the lock/enqueue.In this case the event is buffered in the event queue. As soon as the work item is released, it will deliver the buffered event immediately. You use parallel processing where you have a fork with 2 branches (1 Branch necessary for completion). In one branch is a dialog activity step and in the other is a 'Wait for Event' step. While the dialog step is being executed by a user the Wait for Event step receives its event and continues along the branch and completes the fork (Remember only 1 branch needed for completion). Once the end of fork is reached the dialog work item should be set to status Logically Deleted but this does not occur due to the lock/enqueue on the work item while the user is executing it. Since a callback is essential for a workflow to continue running, this callback is suspended (stored in the SWP_SUSPEN table). These callbacks are started again via the RSWWERRE report. If you have not scheduled report RSWWERRE then the work items will remain in table SWP_SUSPEN and the work items will not receive their callback and will therefor will not continue. If there are examples of work items hanging then check table SWP_SUSPEN to see if the callback work item ID is there. If it is then make sure you have the RSWWERRE job running in order to redeliver it. If RSWWERRE is running and the entry is not being delivered then please check for notes using the search term "RSWWERRE" and "SWP_SUSPEN". If there is no entry in SWP_SUSPEN, then check the workflow definition to see if the work item is asynchronous i.e. needs a terminating event as in Example 1 above. Check the event queue via transaction SWEQADM to see if the terminating event is being buffered there. If it is then it should automatically be redelivered so do a notes search in relation to the event queue. Sometimes if there are network problems, system crash, tRFC &qRFC issues in your system you may find that work items will hang. If you check the workflow technical log you will see work items in status "In Process" or "Complete" that will not contine to the next step. The best option here is to check SM58 to see if there are entries here in relation to the tRFC execution. If you want to find out the corresponding work item to the entry in SM58 then double click on the entry under 'Transaction ID' and this will provide some useful information such as the standard task, business object, object instance, related event and work item ID. These details are not always provided but you should be able to get enough information to be able to track down the work item ID e.g. If it has the Task ID then goto SWI1, enter the Task ID as well as the date & time of the entry and you should be able to narrow it down. The entries in SM58 can be restarted as long as the issue that caused them to be there in the first place has been resolved. You can select the entry in the list and then goto the menu: EDIT => Execute LUW to restart one entry. If you want to process many entries then goto the menu EDIT => Execute LUWs or schedule the report RSARRCEX with the correct data. Check ST22 to see if there are any related short dumps to the hanging work item. If you search ST22 with the date and time the work item was executed as well as the executing user or WF-BATCH. You can usually find out exactly where the dump occurred and if it is custom code or SAP Standard code. A short dump may occur for example in custom code due to poor exception handling within the method code. If this is the case then the best option is to test the object method via transaction SWO1 with the data from the work item container which you can get from the workflow log. If the object method is SAP standard code then you will need to identify which application area is responsible for the object method and create a message in this component. The overall performance of SBWP can be controlled by a number of factors which are listed below. Please put a WORKITEM archiving strategy in place so you can keep your workflow table size under control. You use transaction SARA and archiving object WORKITEM in order to archive work items and this will list the tables that will be affected. The lower the number of entries in the workflow runtime tables the better the performance of the workflow engine. This BAdI enables you to limit the number of the work items displayed by filtering. It is mainly suited to scenarios where all users are working on the same inventory of work items (for example, call center). Hiding the dynamic columns improves performance in the Business Workplace. If this is not possible, you can implement the BAdI WF_BWP_DYN_COLUMN to determine the values of the dynamic columns directly from the application data. If you go with registering the destination you must have your RFC parameters set correctly so that there are not delays in processing work item execution due to lack of available dialog processes and so on. When the event linkage gets deactivated, a mail is sent to the SBWP of the WF administrator, detailing the cause of the error. Usually this is due to incorrect data being passed from the Object event to the event receiver/workflow template. Please check the inbox(not workflow inbox) of the Wf admin for mails around the time of the deactivation and you should get your answer. Have you thought about using the Event Queue (Transaction SWEQADM)? You can use the event queue to try an balance the load of workflows being triggered. The event queue will store the results of the event linkage temporarily in a database table after the start conditions and check functions have been evaluated (If you use Start Conditions). However, you can also use the event queue to store events that are in error and when you have corrected you can redeliver the events. In SWE2, set the flag 'Enable event queue' in the event linkage. Also set the 'Behaviour upon feedback' = Do not change linkage. You can set the basic data of the event queue with transaction SWEQADM. What event is triggering the workflow? Is it SAP standard or a custom designed event. Sometimes with custom designed/raised events, not all information is passed from the event to the receiver/workflow and so will cause deactivation. Enter the Event, for the receiver type enter a user name (your user name), and for the receiver function module enter SWE_EVENT_MAIL. You will then get the event container in an email for every event and can see if some data is missing. It could be possible that a mandatory input element in the workflow is not passed from the event. Create or make a change to a workflow in your development system and transport it to Test. 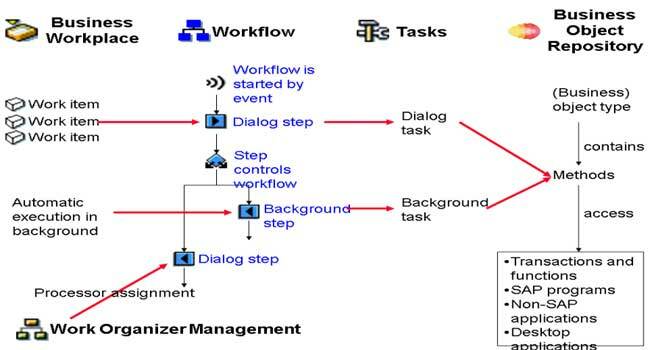 If the workflow already exists in Test and it has running instances then a new version of the workflow is created automatically in Test. This is done so that the existing instances can use the old version and new instances created after the transport can use the new version. If the workflow already exists but had no existing instances (In Test) then it would simply be overwritten with the new transport. You do NOT need to have versions synchronized between systems. Do the Source and Target systems have the same system date & time? If you created any new container elements in your workflow can you make sure that the their data references also exist in the test system. Did you create any new tasks and add them to the workflow in the development system. If so please make sure that you also transported the task to the quality system. Have you checked transaction SWDM -> Extras -> Transported workflows in the target system? It will show up in red if there are any issues. 1 Automatic transport of all Org plan changes. Table T77S0, entry TRSP.CORR is set to space. 2 Manual transport of Org plan changes, by manually selecting what part of the Org plan is to be transported. Table T77S0, entry TRSP.CORR is set to 'X'. Program RHMOVE30 performs the transport. 3 Transport via an object lock by using a change request. Table T77S0, entry TRSP.CORR is set to 'X'. Program RHMOVE50 performs the transport. If you are experiencing performance issues with SWN_SELSEN or RSWNUWLSEL then please review the following tips. The selection of the notification/workitems is logged by using the application log. You can influence the log level via transaction SWNCONFIG. Call transaction SWNCONFIG -> Goto the General Settings. There is a setting called MAX_PROBCLASS. When you choose e.g.log level 1 then only the very important information is logged. Changing the log level may help with performance. Store them in table SWN_NOTIF. This means insert new notifications, logically delete obsolete notifications and update notifications. Are there open work items belonging to tasks where there may be an agent assigment issue. e.g. If a task or tasks have a position assigned to them but the position no longer exists. If this is the case then RSWNUWLSEL tries to determine the agents of work items without any result and will slow performance. One way to determine this is to run transaction SWI2_ADM1 to see if there are many work items without any agents. If this is the case then reorganizing your work items in your system will help. Also check if the work items are still relevant and if not maybe they can be archived or deleted. For information about deleting and archiving work items, please take a look at 573656. In addition there is program RSWNNOTIFDEL. This program deletes entries from table SWN_NOTIF which are in status logically deleted. A notification gets status logically deleted the corresponding work items is completed (processed). So to keep the number of entries in SWN_NOTIF as small as possible you should schedule RSWNNOTIFDEL periodically. A suggestion would be running it with the default value 10 days. If this is not sufficient you could change the value later on. Very nice explaination, thanks a lot.